KINGSTON, N.Y. – On the morning of Tuesday, Feburary 12, Acting County Executive Adele B. Reiter and Deputy County Executive Marc Rider joined with members of the Ulster County Department of Public Works ahead of severe winter weather expected to hit on Tuesday afternoon through Wednesday morning to review storm preparations. The National Weather Service and local weather experts are forecasting 2 to 11 inches of snow accumulating at rates of 1 to 2 inches per hour, wind gusts over 35 miles per hour, and significant sleet and ice accumulations in some locations. Travel conditions are expected to deteriorate throughout the day on Tuesday, and freezing rain and high winds during the overnight hours are expected to limit visibility and create hazardous conditions on roadways. “While we most of us are home tonight staying safe and warm, our DPW crews will be out taking care of our County’s needs. Time after time when the dangerous weather comes our DPW is prepared to respond, working day and night to make sure the job gets done. I thank them all very much for their great assistance to our residents,” stated Acting County Executive Reiter. - Monitor local media for updates on weather conditions and check with local municipalities for updates on emergency declarations, which can affect local parking, garbage collection, and other municipal service schedules. 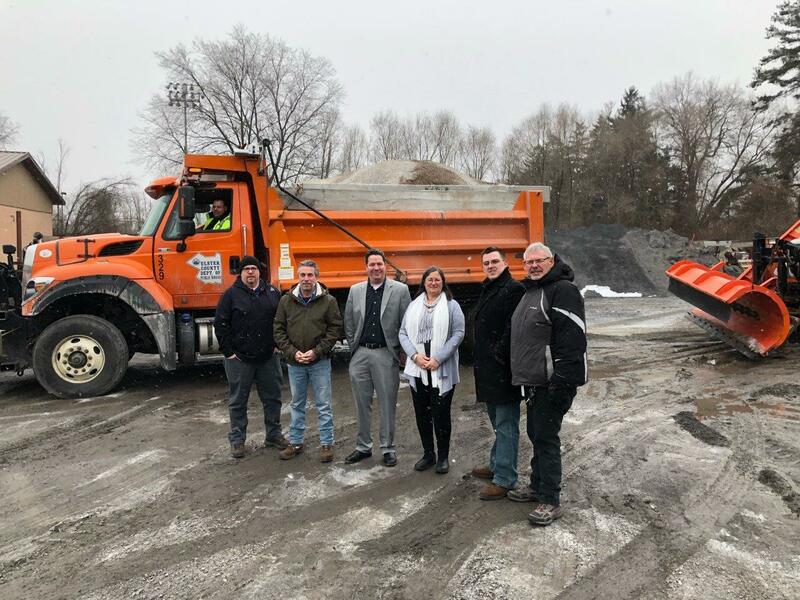 Acting County Executive Adele B. Reiter and Deputy County Executive Marc Rider with staff from the Ulster County Department of Public Works prior to commencement of winter operations on Tuesday morning. Pictured (L to R), Wayne Crispino, CEO I (in vehicle); Brendan Masterson, Highway and Bridges Field Operations Manager; Bob Buser, Deputy Commissioner for Buildings; Marc Rider, Deputy County Executive; Adele B. Reiter, Acting County Executive; Don Quesnell, Deputy Comissioner for Finance; Ron Suits, Deputy Commissioner for Capital Contracts. Not pictured, but assisting with Tuesday’s storm preparations: Jack McGarril, Section Supervisor; Lauren Pedersen, CEO II; Steve Benicase, CEO I. A DPW crew loads sand at the Kingston DPW Headquarters as snow begins to fall on Tuesday morning.